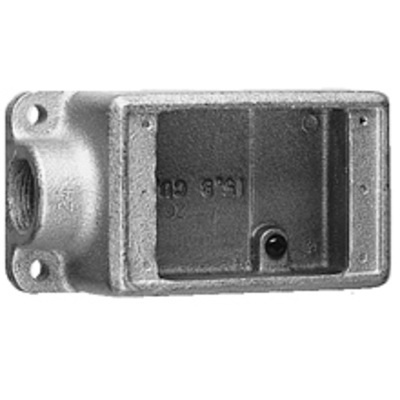 Crouse-Hinds Condulet® 1-Gang Shallow FS device box features die cast aluminum natural finish. It allows access to conductors for maintenance and future system changes. It measures 2-3/4-Inch x 5-5/32-Inch x 1-7/8-Inch. The flush mountable box has capacity of 15.8-Cubic-Inches and 3/4-Inch hub. It is suitable for use with threaded rigid and IMC conduit. It is perfect for use in wet locations when used with gasketed covers. FS device box is UL listed, CSA certified, meets ANSI standard and Federal specifications.